NH Lakes Region Real Estate Blog | Maxfield Real Estate . The first time I heard Susie Burkes voice and David Surettes playing of the guitar, mandolin and octave mandolin I was stunned at their musicality as a duo. Susies voice and Davids accompanying of songs which often speak to the heart or are playful and fun will, I believe, make them favorites of yours too. For only ten dollars for a button you get to visit all the performance venues, not only hearing amazing artists perform their music, but can see Wolfeboros Village Players perform, ice sculptures being made, face painting and mask making, an Olde Tyme Magik Show, marionettes, a Celtic Odyssey Contra Dance, and many many more wonderful activities. Buttons can be purchased at the Wolfeboro Chamber of Commerce on Railroad Avenue or at all select site locations the evening of December 31st. Dont miss your chance to ring out the old year and ring in the new with an extraordinary event, and have a Happy New Year from Carol and me at Maxfield Real Estate! Just one more reason why living in the Lakes Region of New Hampshire is so special. As a music teacher in the Lakes Region, I can appreciate many different perspectives on holiday music. As a Christmas shopper, on the other hand, my sense of aesthetics rankles as much as the next guy over the canned holiday music retailers foist upon us to inspire greater holiday purchasing and boost the holiday spirit. "I Have a Little Dreidel" and "O Hannukah" have had their air time and we've moved solidly into"Santa Claus is coming to Town" and "O Christmas Tree". "Sleigh Ride," by the way, has a great non-denominational appeal. But Tuba Christmas is another animal entirely. In fact, I would wager that tubas were present in the original manger. These magnificent brass wonders have only been excluded from modern crèches because of their size, expense and susceptibility to weather. The lofty subject matter of Christmas carols and holiday melodies paired with the basso profundo of the tuba is a not-to-be-missed combination. 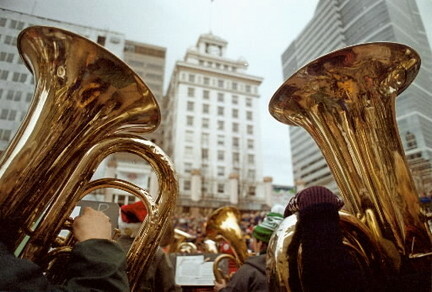 The low notes of the all-tuba orchestra have an uncanny way of moving the body and soul. There is something incredibly uplifting about experiencing sacred and secular holiday tunes on such a visceral level, it is not unlike the effect of baroque cathedrals designed specifically to inspire the fear of God through acoustic engineering. Tuba Christmas is a gathering of tuba and euphonium players for the free public performance of holiday music. Tuba Christmas takes place in every state in the US and in some European countries. Though there is another Tuba Christmas concert in New Hampshire in Colebrook this Satrtuday, Tuba Christmas has already graced the Lakes Region.The big brass band played on December 11 at the All Saints Episcopal Church in Wolfeboro, put it in your calendar for next year! I do encourage you to embrace the season by supporting local music throughout the Lakes Region. You'll find it in your schools, concert halls, night clubs, and on the streets. And here: December 17, 2010 Lakes Region Singers' Annual Christmas Concert The 18th annual Lakes Region Singers' Christmas Concert -- 7:30pm at the Gilford Methodist Church on Route 11A. It is free to the public with complimentary refreshments. December 18, 2010 Classical Christmas Concert & Traditional Carol Sing-along Featuring celebrated musicians; violinist Jeffery Kazukiewicz, flutist Bridget Kazukiewicz & cellist Beth Pearson; and vocalists Rev. Gina Finocchiaro and Marcia Schneider. And the theFirst Congregational Church of Wolfeboro Choir will lead a sing-along of our favorite Christmas Carols -- 7PM on Saturday, Dec. 18th at the First Congregational Church of Wolfeboro! December 19, 2010 Gilford Community Band Concert 50 fine musicians performing a selection of Christmas songs -- 3:00pm at the Gilford High School Auditorium. Merry Christmas!